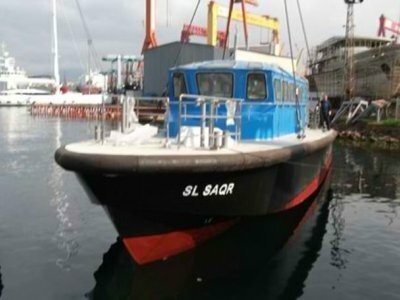 The Interceptor 60 / 18.5m pilot vessel has a L. O. A. 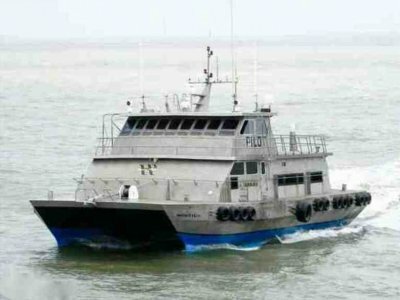 Of 19.5m and offers Ports and operators the option of pilot vessel with the highest levels of endurance and sea keeping and is suitable for operations where transfers occur far offshore, and where very rough sea conditions may prevail, or where the capacity to carry up to 12 pilots is required and provide for a long endurance capability allowing full live aboard facilities. The fore peak extends aft of the bow and is a void space provided with a sole and capable of being used as a storage area. There is full access to all fittings and the area is flow coated. The area is accessed from the forecabin via a watertight door in the b/head. And from the deck via ladder and a Hercules aluminium deck hatch. The anchor, chain and warp is stored in a recessed anchor locker accessed from the deck. A large, spacious accommodation area extends between the fore peak and the f/wd engine room b/head and offer full live aboard facilities and space for her crew should this be a requirement. This are provides a full galley with a sink and pressurised water, a 240 v mains outlet for a microwave and a kettle are fitted. Lockers provide storage space. A spacious dinette area for 6 persons is provided opposite with a table between. To port are two bunk berths. A separate heads compartment on the st/bd side is accessed from the forward accommodation and is fitted with a electric Jabsco sea toilet, with overboard discharge. A S/S sink with fresh water tap. 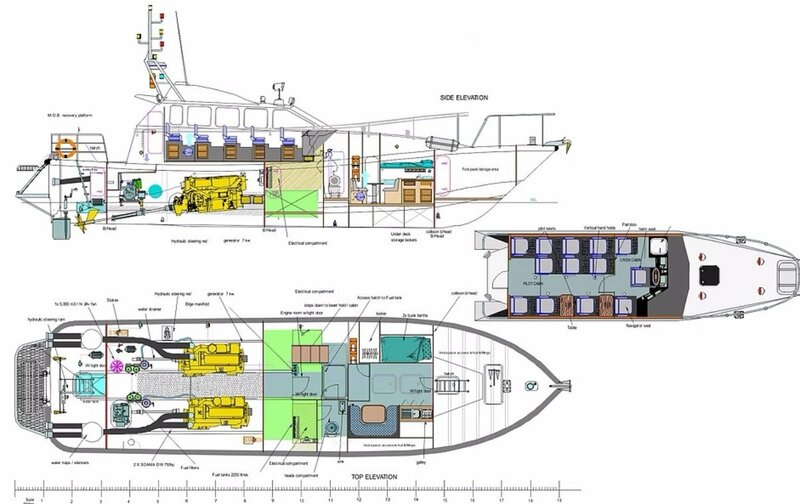 The wheelhouse is divided into two separate areas, crew compartment and pilot / passenger compartment. The crew compartment f/wd contains a central helm position which facilitates ease of coming alongside on either port or starboard. A GRP helm console fitted with a horizontal steering wheel (bus / lifeboat style) with a recessed foot rest allowing comfortable posture when steering. The engine controls fall easily to hand. All engine instrumentation and navigational equipment is easily viewed and easily operated. The wheel house windows are aft slopping to minimise pressure loadings on the glass are when impacted from large breaking seas. The helm position is fitted with a CAB 500 Series hydraulic damped and sprung helm set on a pedestal. Adjustable for height and fore and aft adjustment. A navigators position is positioned to st/bd and a crew position is positioned to port, both with suspension seating. A partition with large glass panels and door divides the compartments. 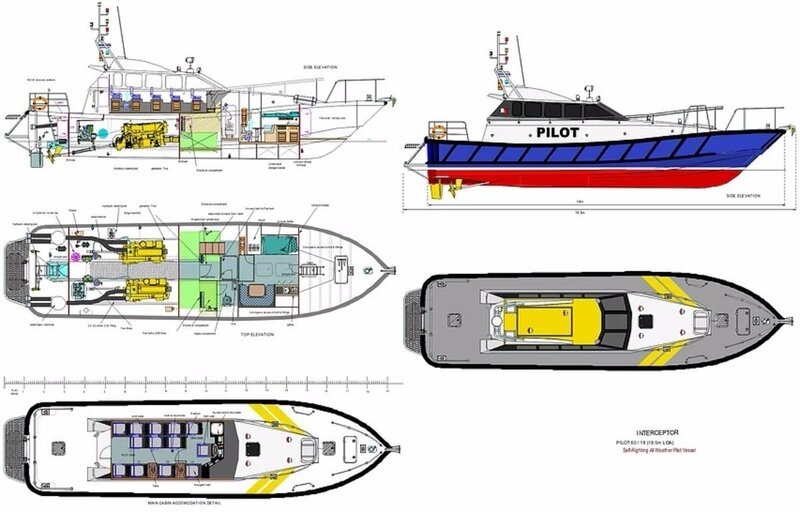 The Pilot / passenger cabin is fitted with 11 similar CAB 500 Series pilot seats (depending on requirements for the amount of pilots the port needs to carry) on GRP Pedestals with footrests. There is in addition (depending on seating requirements the option of a U shaped settee and table at the aft of the cabin and work top opposite with storage lockers underneath. The cabin sole is of black studded rubber as standard with the option of Teak and holy sole if a more luxurious environment is required. The vessel is fitted with a POWER hydraulic steering system consisting of a HYPRO MARINE engine driven 170cc power pump, tiller cylinder steering ram and helm pump, providing the craft with a hard over to hard over of 3.5 wheel turns without being overly heavy in steering effort. Fitted with a bypass valve to allow operation via the emergency steering tiller arm. The system uses hydraulic hose to connect the steering system throughout the installation. An emergency steering tiller is supplied and stowed in the aft compartment. The Interceptor 60 is of GRP construction. 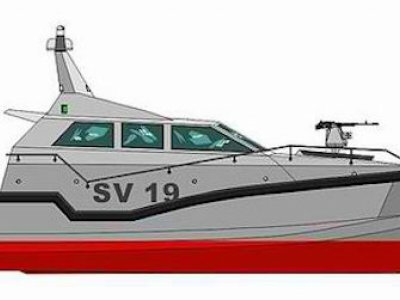 Its hull design is of a Deep V, twin chine, semi displacement design providing excellent sea keeping especially in big Atlantic or Ocean waves, or where tidal influences introduce dangerous breaking seas. 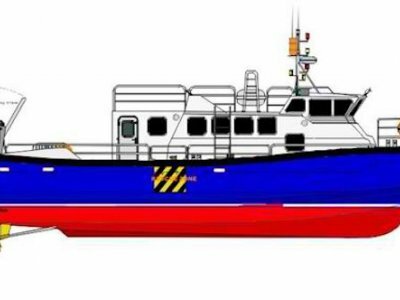 The design is capable of operating safely in all weather conditions up to and including Storm force 10-11 and wave heights up to 8m+. The vessel displays safe, predictable 'alongside ship' handling characteristics and can be specified as Self-Righting, able to recover safely after capsize by a large breaking wave. The Interceptor has a wide beam combined with moderately deep V aft sections this provides the necessary high levels of directional stability needed to prevent any yaw and roll that can induce broaching, when surfing on the face of large waves. This beam, coupled with a very low centre of gravity are the designs key factors in being able to run safely, in big quartering following seas. Quick light steering with minimum turns lock to lock, and large rudders give instant correction to the helm inputs. The bow design is full above the waterline with plenty of flare, this gives sufficient buoyancy to prevent shipping green water. Running into big head seas the design is excellent. Her deep V hull sections, 22 degrees amidships, and a fine 52 degree waterline entry at the bow means she is very soft riding, with low vertical accelerations for crew comfort. She has a high bow with plenty of freeboard forward and amidships. The superstructure is positioned well aft for crew comfort. The designs 'twin chines' make her a very dry boat, especially so at boarding speeds, and her bow flare contributes to this. The hull design is also excellent in a short 1-2m chop, her fine forward sections effectively cut through smaller waves providing a smooth ride. From the outset, an important part of the design criteria for the interceptor 60, was that the vessel to be inherently self-righting. This is achieved as a result of the superstructure designs size and buoyancy, preventing the vessel from staying in an inverted position after capsize by a breaking sea. The superstructure is of a size large enough, with enough internal volume to automatically right the vessel. 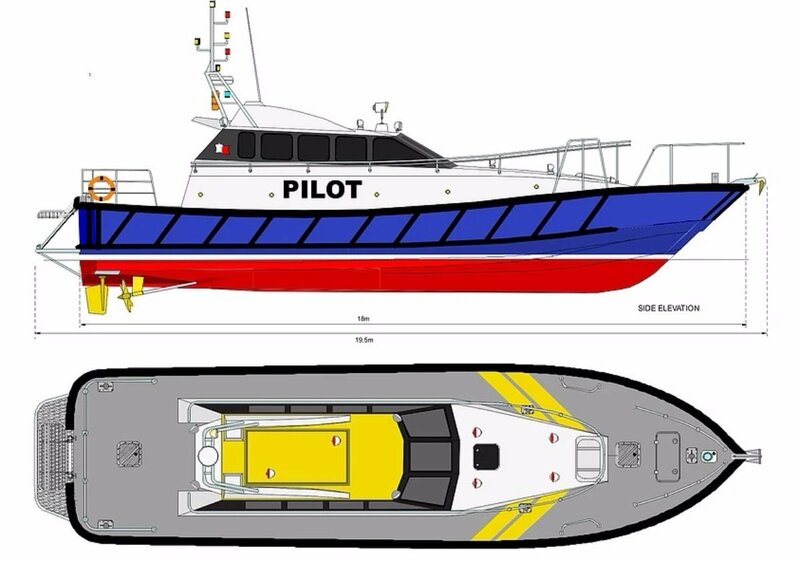 Obviously there are a number of other factors affecting the self-righting capabilities of a vessel, and the Interceptor 60 pilot boat incorporates a number of design features to achieve self-righting.